In 2014, Thailand’s IoT spending was US$ 57.5M. By 2020, its IoT market is forecasted to increase to US$1 billion, posting enormous opportunities to the potential investors. Thailand is undergoing economic transformation, moving forward to becoming a valued-based and innovation-driven economy under the Thailand 4.0 policy. The government has realized the importance of Internet of Thing (IoT) in transforming the country and been making tremendous support for IoT adoptions and foreign investments in related industries. With the launch of multiple initiatives and incentives such as Digital Park and SMART Visa over the years, Thailand aims to be one of the preferred investment destination in Asia. The foreign direct investment for the 10 targeted industries was $151.638 THB million in 2016 with the top 3 being automotive, petrochemical and electrical and electronics which posts more room for growth to investors wanting to tap into the growing industries. In the 2018 Asia IoT Business Platform Singapore conference, Dr. Sumavasee Salasuk, Director of Digital Innovation Promotion Zone, Digital Economy Promotion Agency had further emphasized that the new S-curve industries will be the main focus for the country this year. 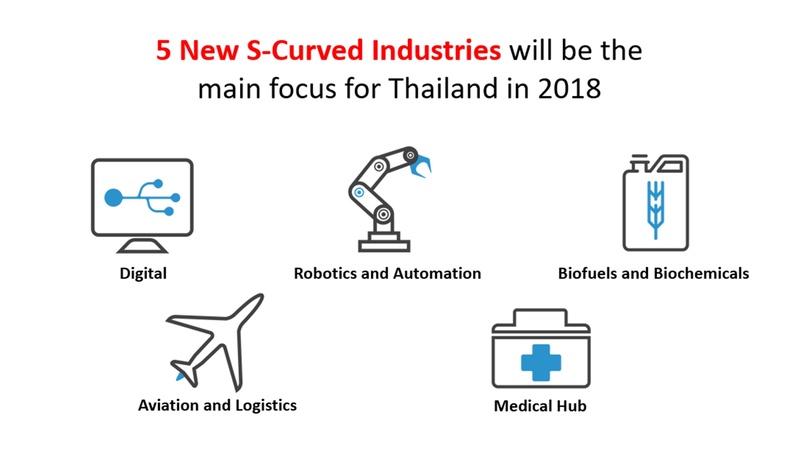 The goal is to establish the new S-curve industries to enhance Thailand’s competitive advantage with advanced digital technology transformation. Thailand’s digital industry will focus on IoT and Artificial Intelligence which could give opportunities for foreign investors in developing IoT solutions for different industries within the country. Currently, Thailand’s IoT expenditures focus mainly on the manufacturing and logistics industries while agriculture spending is relatively low. However, agriculture accounts for 40% employment and 10% of GDP. Agriculture is definitely an important sector that the government is paying attention to as it is actively giving incentives to enterprises to make Agriculture 4.0 more feasible. Demand for robotics and automation in the industrial and manufacturing industries is on a rise as well. The lower operating costs through automation and increasing productivity are driving the demand for robots and automation systems within the country. Over the past few years, manufacturers are investing heavily in machinery and systems to stay competitive in the global digitalized manufacturing landscape and to meet the growing export demand in food and beverages, automobile and petrochemicals. 50% of manufacturers in Thailand are considering adopting automation systems within the next 1-3 years. As mentioned by Dr. Sumavasee, the government is pushing to achieve smart manufacturing adoption in at least 2,000 factories by 2018, posting attractive opportunities for robotics and automation technology providers. Aviation and logistics is another promising sector for IoT and blockchain technology solution providers. Thailand is aiming to be a logistics hub in ASEAN. With EEC, technologies integration in airplanes and carriers will be needed to create faster and more comprehensive routes between ports, airports and industrial clusters throughout the country. Development of high-speed railways will also be expected to connect the three international airports, U-Tapao, Don Mueang and Suvarnabhumi. With Thailand being one world’s leading exporter of agriculture products, it plans to explore the opportunities in biofuel and biochemical industries. The government has recently launched a 10 year plan to establish a bioeconomy hub. Investment from private and private sector are forecasted to reach $11.3 billion. It plans to produce biofuel, biochemical and biopharmaceutical with the use of sugarcane and cassava products. The export of bioplastic products is forecasted to increase over the next few years making adoption of biomaterial production technology necessary. Thailand is undergoing a digital economy transformation. It has grown to be one of the fastest growing IoT markets in ASEAN. The fact that the government is in favour of IoT adoption and actively promotes foreign investment in the related industries augurs well for increasing demand for IoT technologies, especially in the 10 targeted industries. The increasing demand for IoT technologies in various industries, the rapid infrastructure development to embrace digital economy transition, the availability of talent together with the support from the local government has put Thailand in an ideal position for IoT growth. Download the 24th edition of Asia IoT Business Platform Thailand post conference report here.